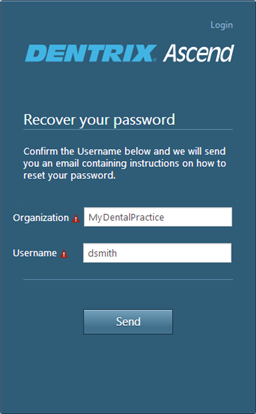 If you have forgotten your password, you can reset it so that you can log in to Dentrix Ascend . 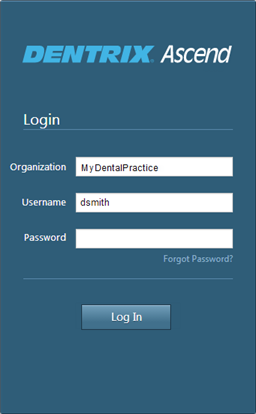 On the Login page for Dentrix Ascend website, click (or tap) the Forgot Password? link. The Recover your password page opens. Confirm that your Practice ID (organization name or customer ID) and Username are correct. If either one is not, type the correct information. Note: You must know both of these pieces of information to reset your password. A confirmation message appears, and an email message is sent to you that contains instructions on how to reset your password. Open your email program, and locate the automated email message that was sent from Dentrix Ascend Support. Click (or tap) the Set your password link in that message. 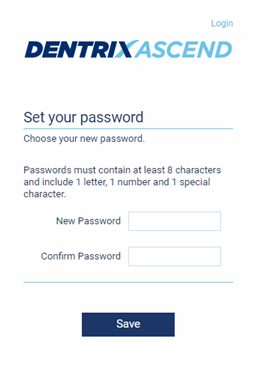 Type a new password in the New Password and Confirm Password boxes. The password is masked with dots as you type. Now you can log in using the new password that you have just created.